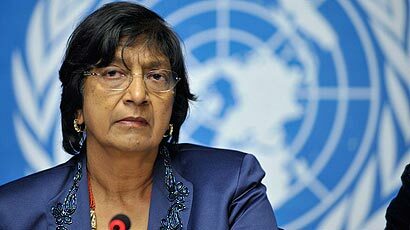 Sri Lanka welcomes Ms. Pillay. After 30 years of terror Sri Lanka breathes freedom minus terrorist attacks and suicide missions. Civil crimes that take place everywhere round the world cannot compare to the fear 20million suffered during 3 decades of terror. 4 years on we hope that Ms. Pillay will view for herself the measures taken in the areas of rehabilitation and reintegration examples of which needs to be showcased as casestudies for even nations like and NATO who lack similar programs despite militarily invading nations on the guise of humanitarian intervention. Abducting Tamil children as young as 10 years turning them into child combatants. Denying Tamil children their fundamental right to education as well as what UN is doing about the 350 plus “Eelaam Madrasas” throughout Europe indoctrinating Tamil children to hate Sinhalese. Forcing Tamils to commit suicide by taking cyanide – policy indoctrinating suicide is a criminal offence. Denying Tamils freedom of movement, where throughout 30 years the LTTE issued passes for Tamils leaving the Wanni with permission given to leave only on medical grounds and for the elderly which depended upon leaving a member of family as “guarantor” or making a payment. Issuing passes to Tamils and keeping a computerized database of all Tamils living in Sri Lanka and overseas to take payments from them. Forcible unpaid Tamil labour to dig trenches and construct bunkers which is against Geneva Conventions. Using Tamils as Human shields – forbidding their release and the LTTE shielding themselves amongst Tamil civilians in the no fire zone as well as hiding their weapons amongst civilians which is a total violation of the Geneva Convention. We would also like to know why all the UN convoys that traveled to the North did not make a single attempt to persuade the LTTE to release Tamil civilians and not a single elderly Tamil or Tamil child or any sick was brought back in these UN convoys. Why did the UN not use their office to secure the release of the young and old Tamil civilians from the LTTE when they were on friendly terms with the LTTE? Confiscating Tamil assets and property by the LTTE, inflating civilian figures so as to get additional food provisions to be distributed only among LTTE families. LTTE’s killing of its own people where over 250 Tamils have been gunned down by the LTTE? – Has the UN investigated why the LTTE fired upon fleeing Tamil civilians and cut hairs of young Tamil girls to mislead the military into thinking they were the LTTE. This was an accusation by UNSG but not a single investigation was launched. Despite numerous arrests and reports of the LTTE terror financing on foreign soil and kovils, charities, humanitarian organizations all operating as front organizations of such activity what proactive action has the UN taken to curb these terrorist activity? When the LTTE has committed crimes under international laws why has the UN not taken action in 30 years? The LTTE committed a crime under Common Article 3/1949 Geneva Convention and 1977 Additional Protocol 11 – confrontation with the SL armed forces as a “dissident” armed force under a “command”, controlling part of Sri Lanka’s territory illegally. Third and Fourth Geneva Conventions/Additional Protocol 1/International Criminal Court declaration that “utilizing the presence of a civilian or other protected person to render certain points, areas or military forces immune from military operations” constitutes a war crime – what has the UN done against the LTTE for these violations? When the world celebrated the death of Osama with fireworks and mass celebrations the UN Secretary General did not issue a statement asking the people not to indulge in triumphalism – but he did so when after 30 years the Sri Lankan armed forces finally eliminated a terrorist movement that had prevailed at times with the nod of foreign governments and foreign leaders. Do we apologize for defeating one of the world’s most feared terrorist organizations? Do we apologize because the West can no longer use LTTE as a forward to advance their agendas in Sri Lanka and the rest of South Asia? Do we apologize because we have angered many an NGO who now have no reason to remain in Sri Lanka and whose livelihood is at stake? Are we to apologize because a lot of other people who stood to gain while the LTTE prevailed and the discussions for political solutions meant that many were enjoying additional perks and privileges? Do we apologize because a handful of Tamils using the Sri Lankan situation as a plank to obtain refugee status now find themselves called “economic refugees” and are being sent home? Do we also apologize because those that made merry out of the troubles in Sri Lanka pocketing from the USD300million LTTE kitty are now having to devise other ways to keep the show running? Do we apologize for creating an indigenous rehabilitation program and reintegrating close to 12,000 former LTTE combatants who now lead a life of normalcy. Do we also apologize for giving a Presidential Pardon to 594 former child soldiers because the Sri Lankan state considered them victims rather than perpetrators? Do we also apologize for putting these surrendered former LTTErs through proper education and vocational programs and allowing them to sit for the O/L and A/L examination and embarking on their careers or further education? Do we also apologize for introducing these former Tiger combatants to society just as some laughed at the manner the female former tigers were modeling clothes on the catwalk? Would those that laughed at these girls prefer them to be holding guns? Are these people laughing because these former combatants were married in a marriage ceremony organized by the army, are these people envious that these former combatants are now singing, dancing and some involved in even acting? Do we apologize for ending the war and ending the manner in which LTTE kidnapped poor and low-caste Tamils and turned them into LTTE child soldiers? The reason why these children never made the news was because of the rigid Tamil caste system and because NOT a single Tamil politician, NOT a single member of the Tamil Diaspora cared what happened to these child soldiers because they were not only poor they were LOW-CASTE – thus outcasts of Tamil society! Do we apologize for taking vast amounts of loans some of which were supposed to be for development of the South and instead went to develop the entire infrastructure framework of the North that had been totally neglected by the LTTE and their stooges? Do we apologize for giving electricity to Kilinochchi and Mullaitivu – areas where for 3 decades the people were denied electricity because the LTTE blew up the transformers wanting to keep the people in the “dark”? Do we apologize for maintaining military presence in the North because we are well aware that the destabilizing operators are still hunting to carry out some type of covert operation? Are we insane to recall the military when we know the ground realities? And who says the military is not welcome in the North? The people of the North prefer the military amongst them far more than they want their own politicians and this is visibly clear in Mullaitivu. We are well aware what media campaigns are capable of doing and of media personnel who enjoy putting spins. Do we also apologize for bringing normalcy to the entire country? For bringing peace, for making sure not a single bomb has gone off, for ensuring not a single assassination has taken place by LTTE in 4 years? That is a comprehensive list of questions to Chief of UNHRC. Well done Shenali, you have lbw’ed M/s Pillai while she was walking from the pavillion to the crease to face outstanding SL Leadership Cricket team’s spin bowlers. I have already emailed this list of questions to Geneva through my diplomatic connections. I am sure the UNHRC’s office will be forced to go into overdrive to draft replies to these questions. Ms Pillai as Chief of UNHRC has bigger problems to wade through ….Egypt, Libya, Syria. The issues are vast and the people involved has little respect for the UN let alone UNHRC so why should the Sri Lankan take her seriously. If she is to be taken seriouly then she should accept the legitimacy of the Sri Lankan Government and that government is the sole representative of the government. The Tamils claim that they are a persecuted race like the Jewish people under Nazi Germany. Then she should look for tangible evidence to support these claims since British Colonial times. Catalog all atrocities committed by the Tamils in the name of liberation and call for a catolog of the dead. Catalog the dead in the final confrontation.